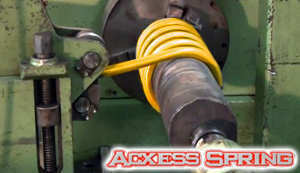 Production springs are made to exact tolerances on CNC coilers, CNC spring formers, CNC lathes and CNC wire benders. 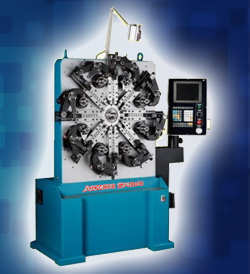 Our spring machines are state of the art using the most advanced equipment available today. 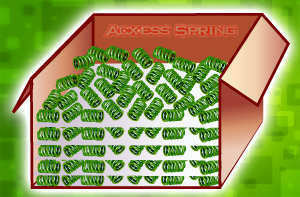 Acxess Spring fabricates production compression springs, coil springs, torsion springs, extension springs, tension springs, garter springs, belt springs, wire rings, conical springs, tapered springs,and barrel springs. 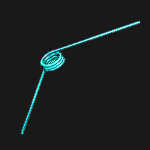 Our production springs are made to exact tolerances from wire diameters of .006 inches to 1.000 inch in wire diameter. We stock and can make small, medium and large production springs to your specifications. 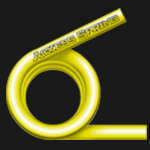 We can make bends, u-shapes, hooks on your springs of any style. We have the experience to produce repeatable results as well as help you with your spring challenges. We have helped many customers improve their spring designs. 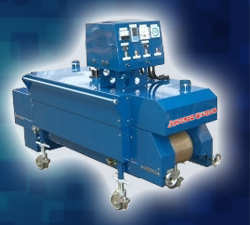 Production compression springs or coil springs are made on cnc coilers which pull and push the round wire into rollers and guides then comes into contact with coiling points which are fingers that are grooved for the exact wire diameter. The coiling points reverse the direction of the wire thus producing a coil spring or compression spring. 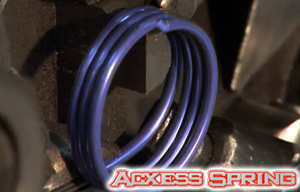 The pig tail shaped spring comes out of the coiling points as a round coil spring. This process is known as coiling the spring. 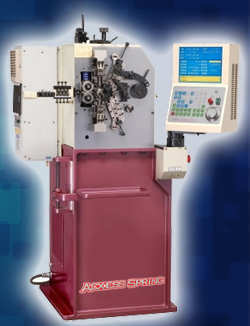 It is a precision spring making machine that produces repeatable results that can make production springs to exact tolerances. 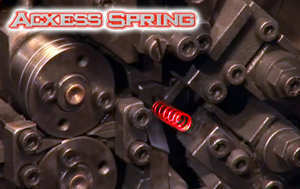 Production extension springs are made on a spring former or a coiler. Using the spring coiler the extension spring goes thru the same process as a compression spring or coil spring by pulling the wire through rollers and guides and forming it into a extension spring. 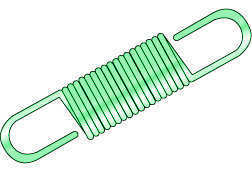 Using a spring former is different in the aspect of the wire still goes through the rollers, guides and coiling points but the spring former has the ability to make hooks on the ends of the extension springs. Spring hooks types like, machines hooks, extended hooks, and cross over hooks are easily made with the spring former. 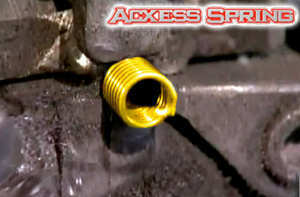 The mechanical hooking tool enables the spring former to form various style hooks on the ends of the extension spring. Production torsion springs are made on either, cnc coilers, spring formers, lathes or torsion spring making machines. The cnc coiler and the spring former work by the wire being straightened then being pulled into the rollers then going through the guides, then coming into contact with the coiling points. The coiling point is below the level of wire so as to produce the front leg length. The coiling point then raises up to coil the body coils of the production torsion spring. When the torsion spring is finished coiling all the coils the coiling point lowers itself down so as to produce the back of the torsion spring. A torsion spring made on a lathe is wound on an arbor or mandrel by placing the wire through a catch so as to secure the front leg into the catch. The lathe then winds the spring around the mandrel or arbor creating a production torsion spring. Packaging production springs can be as simple as placing the springs in zip-loc bags or layering them in a box to prevent tangling of your spring. This process known as layering the springs with paper or carton levels help the springs from becoming tangled. Give us a call we have the solution for your production spring packaging. You can also design your spring with our Production Spring Calculator by clicking here. Our spring calculator will design your spring and give you all the parameters your spring is capable of. It will also generate a blue print of your spring. 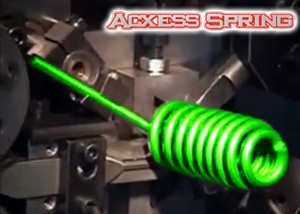 Acxess Spring looks forward to serving your production spring needs.